SAGNAC, GEORGES M. M. (b. Perigueux, France, 14 October 1869; d. Meudon, France, 26 February 1928), physics. Sagnac studied mainly the radiation produced by X rays and the optics of interference. He is remembered today primarily for his design of a rotating interferometer and for the experimental results it provided. He was? very interested in the theoretical analysis of optics of moving systems; his approach was classical,and he interpreted the results of his optical experiments as contradicting Einstein's theory of relativity. Sagnac came from an old bourgeois family. His father was a lawyer who directed the Assurances Generales, and his mother was the daughter of a notary. From 1889 to 1894 Sagnac studied at the Ecole Normale Superieure and at the University of Paris. In 1894 he received his agrege and became an assistant in physics at the university. 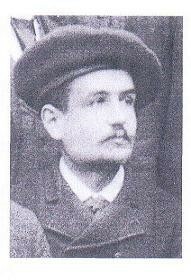 In 1900 he was awarded the docteur es sciences degree and became professor of physics at the University of Lille. From 1911 he was professor of physics at the University of Paris. He was twice a candidate for the physics section of the Academy, and he received the Pierson-Perrin, the Wilde, and the Lacaze prizes. Sagnac's earliest research (and the subject of his dissertation) was motivated by the newly observed X rays.l From 1896, the year following Rontgen's discovery, to 1900 Sagnac studied the radiations produced by X rays. He observed that secondary radiation is produced when X rays fallon heavier metals. He showed that this radiation contained secondary X rays (of lower frequency than the original X rays) and negatively charged rays. He suggested that it was through the action of the negative rays that X rays produce ionization in air. Sagnac next worked on the propagation of light in moving systems (he was particularly interested in the Fizeau effect) and with the optics of interference. From about 1910 he was especially concerned with designing and using a rotating interferometer. In this instrument all the componentslight source, mirrors, and photographic plate -are on a disk that can be rotated at various velocities. Light travels around the disk along a polygonal circuit determined by successive reflections from four mirrors placed around it. Light from the source is split into two beams that travel around the disk in opposite directions and, on recombination, produce interference fringes on the photographic plate. In 1913 Sagnac measured the shift in the position of the fringes when the direction of rotation was reversed. Sagnac interpreted the shift in the position of the interference fringes in terms of an "ether wind" that gave the light beams traveling in opposite directions different velocities. He was convinced that the phenomenon observed with the rotating interferometer demonstrated the existence of an immobile ether. Sagnac later tried to develop a theory of electrodynamics that would retain classical ideas of space, time, and ether by analyzing the propagation of energy statistically and separately from the propagation of motion. He retained a lifelong dislike for relativity, and in 1923 he interpreted some observations of stellar color shift as being due to an ether wind, rather than as supporting the general theory of relativity. As Langevin explained it, the experiment can be understood equally well in terms of both classical and relativistic theories (the phenomenon involves only a first-order effect in vIc). The fringe shift is produced by the difference in optical path for light beams traveling in opposite directions around the rotating disk. In fact, the experiment provides a neat way to demonstrate the rotation of a system without reference to anything external to it. As Pauli observed, "It is essentially the optical analogue of the Foucault pendulum. "4 In terms of general relativity the experiment can be understood by thinking of the light in the coordinate system of the disk as being subjected to a gravitational field directed away from the center. De I'optique des rayons de Rontgen et des rayons secondaires qui en derivent (Paris, 1900). A. Dufour and F. Prunier, "Sur ! 'observation du phenomene de Sagnac par un observateur non entraine," in Comptes rendus hebdomadaires des seances de I'Academie des sciences, 204(1937),1925-1927. Paul Langevin, "Sur la theorie de relativite et ['experience de M. Sagnac" and "Sur I'experience de M. Sagnac," in his Oeuvres scientifiques (Paris. 1950),467 -472. W. Pauli, Theory ofRelativity (New York, 1958), 19. Max von Laue, "Uber einem Versuch zur Optik der bewegten Korper," in his Gesammelte Schriften und Vortrage, I (Brunswick, 1961). 154-161. Max von Laue, Das Relativitiitsprinzip, 3rd ed. (Leipzig, 1919); and "Zum Versuch von F. Harress," in his Gesammelte Schriften, I. 526-541. ORlGINAL WORKS. Sagnac's papers include "Sur la transformation des rayons X par la matiere," in Eclairage electrique, 18 (1899), 41-48; "Theorie nouvelle des phenomenes optiques d'entrainement de I'ether par la matiere," in Comptes rendus hebdomadaires des seances de l'Academie des sciences. 129 (1899), 818821; "Electrisation negative des rayons secondaires issus de la transformation des rayons X," in Journal de physique theorique et appliquee, 4th ser., 1 (1902),1321, with P. Curie; "Sur la propagation de la lumiere dans un systeme en translation et sur l'aberration des etoiles," in Comptes rendus hebdomadaires des seances de l'Academie des sciences, 141 (1905), 1220-1223; "Sur les interferences de deux faisceaux superposes en sens inverses Ie long d'un circuit optique de grandes dimensions," ibid., 150 (1910), 1302-1305; "Les systemes optiques en mouvement et la translation de la terre," ibid., 152 (1911), 310-313; "L'ether lumineux demontre par I'effet du vent relatif d'ether dans un interferometre en rotation uniforme," ibid., 157 (1913), 708-710; "Effet tourbillonnaire optique. La circulation de i'ether lumineux dans un interferographe toumant," in Journal de physique theorique et appliquee, 5th seT., 4 (1914), 177195; "Les deux mecaniques simultanees et leurs liaisons reelles," in Comptes rendus hebdomadaires des seances de I'Academie des sciences, 171 (1920), 99-102; and "Sur Ie spectre variable periodique des etoiles doubles: Incompatibilite des phenomenes observes avec la theorie de la relativite generate," ibid., 176(1923), 161-173. SECONDARY LITERATURE. Sagnac's scientific work was summarized in connection with the Academy's award of the Pierson-Perrin Prize in Comptes rendushebdomadaires des seances de I'Academie des sciences. 169 (1919), 1227-1232. See also Sagnac's Notice sur les tUres et travaux sdentifiques de M. Georges Sagnac(Paris, 1920). For discussions of Sagnac's rotating interferometer experiment, see the works by Langevin, Pauli, and Laue listed in the notes and Andre Metz, "Les problemes relatifs ala rotation dans la theorie de la reIativite," in Journal de physique et Ie radium. 8th ser., 13 (1952),224-238.